Home > Blog > When Is Fire Good? Fire in forested settings is a tricky subject to broach. Recently in Wisconsin, we’ve been experiencing the effects of smoke from wildfires in Canada. We’ve seen headlines about wildfires blazing out West. Locally, once the trees start to lose their leaves, Wisconsin experiences a higher than normal risk of wildfires. With all this information, it would appear that fire is something that we should prevent at all costs. However, this is not always the case, and in this month’s blog post, we’ll explore times when fire can be beneficial to our forests. If we take humans out of the picture for a moment, there are all kinds of factors that affect the growth and health of our woods. Take a snapshot of one place in your woods, and five years from now it will look different. Insects, diseases, and wildlife all depend on our trees, and therefore have varying effects on them. Trees themselves have needs (light, water, nutrients, space) which cause them to grow or die based on availability of those needs. Ice storms, tornadoes, and wildfires alter our woods as well. With all these interactions going on, some trees actually adapted to the occurrence of fire. In some cases, we see where pine trees grew a thicker bark to try to withstand lighter fires. Other species, such as some oak, adapted by reproducing from roots (rather than seeds) after a fire. Jack pine have pine cones that open only after a fire (these cones are called serotinous (pronounced sir-ot-in-ous)). When we take fire away in these cases, we need to find another way to get jack pine to regenerate. One other interesting side effect of removing fire is that those pine now have thinner bark which reduces their resistance to insects that bore into their trunk. Let’s bring humans back into the picture, and we now have homes and cabins sitting in the midst of these beautiful woods. No one wants to risk destruction to their homes and property by a wildfire, so we have a system in place to prevent massive damage. Unfortunately, in some cases, this leads to more fuels on our forest floors, such that when a wildfire does start, our woods are more susceptible to a large wildfire. At this point, we need to understand that a fire isn’t a fire isn’t a fire. Up to now, this article has addressed wildfires. However, there are also smaller fires (called controlled burns) which are started intentionally, and can have beneficial effects when used properly. Controlled burns, or prescribed fires, tend to be less destructive, are used as a tool to promote growth of native vegetation, and can control competition in various landscapes. These smaller fires promote growth by returning nutrients back to the soil, and opening up the ground layer for sunlight to allow tree seedlings room to grow. 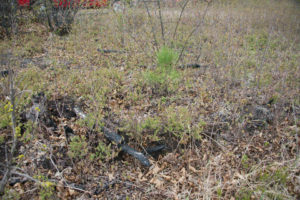 Prescribed fires may be an effective way to control invasive plants in the woods (e.g. buckthorn, honeysuckle, Japanese barberry), especially for large infestations where herbicides can be expensive or unwanted. Work is being done to understand how effective fire is in knocking back these infestations to allow natives a chance to establish. For example, we know that fire is 50-70% effective at controlling first year garlic mustard if done in early spring. Finally, there are certain landscapes in particular that have, as a whole, adapted to fires. In the southern part of our state, managers are more regularly introducing fires back into our oak savannahs and prairies to retain those characteristics of those landscape types.